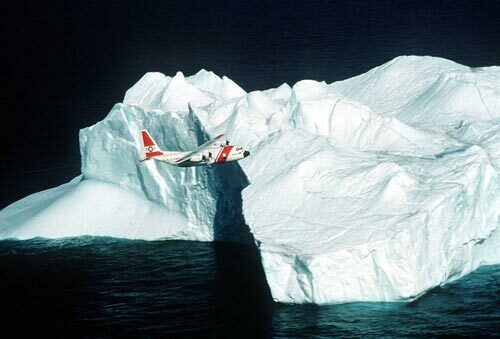 The U.S. Coast Guard on Ice Patrol (Image: Wikipedia). Ever since the RMS Titanic disaster in 1912, the Coast Guard has operated the International Ice Patrol to track icebergs in the eastern North Atlantic. The Ice Center supports this effort and other operational missions by evaluating a variety of national imagery. Similarly, although it is not an official mission, NIC has been tracking icebergs in the Antarctic region for 24 years. Last year the movement of a 24 by 48 nm iceberg into the shipping lanes south of Argentina caused sufficient danger to ships and submarines that many had to be diverted from their planned courses. The International Ice Patrol is located at the Coast Guard Research and Development Center in Groton, Connecticut. Headquarters for the International Ice Patrol is located at the University of Connecticut’s Avery Point campus in Groton. The ice reconnaissance detachment, usually comprised of eleven aircrew and four ice observers flying in a HC-130 aircraft, continues to work out of Newfoundland. Quinnehtukqut and UCONN reprazent! Going back to the original list I discovered that the International Ice Patrol is now part of the Department of Homeland Security. Probably just what happened to the Coast Guard when the new über-agency was formed, but I guess there’s also the fact that “navigational ice” is becoming a big deal these days, what with all the melting. So, there it is, readers—your entrée to a little-known, tactically important and totally legit government agency, replete with awesome photography, right here in the Nutmeg State. You’re very welcome. † Significant restraint was exercised in the authoring of this column in order to avoid making reference to eighties pop icon Vanilla Ice, diamonds and meth-amphetamine. Nobody I know nerds out more thoroughly. watch it, wags. i was THERE, and still the post caused both illumination and chuckling. how duzzz heee doo iiit? not to mention the bottom of the page–genius. genious i tell you. ohh–you thought so too! of course. it’s all new!